We had a USA Table Tennis Board of Directors teleconference on Monday night, 7:00-8:31PM. Attending were all nine board members (including me), plus the CEO, the COO, the HPD, and the S&LC. (Give up on this alphabet soup? The first three are listed on the USATT Staff Page, the third is the Secretary and Legal Counsel, Dennis Taylor.) I'm guessing that I spoke less in this meeting than any past meeting, probably by several magnitudes. However, before the meeting I did do a number of edits to the minutes of the December 2017 meeting - once an editor, always an editor. First on the agenda was the approval of the minutes of the December two-day board meeting in Las Vegas during the U.S. Open, and the January teleconference minutes. After some discussion, they were both approved - I made the motions. They are now both online for your reading pleasure in the USATT Minutes and Actions page. Focus on Performance and Fun to Maximize Your Chances of Winning. The three MDTTC coaches are moving into my townhouse this morning, and I'm helping them, and doing last-minute clean-ups and fixes. Has there ever been a higher-rated group of movers? Chen Alex Ruichao, Wang Qingliang, Wu Jiacheng, Cheng Yinghua, and Jack Huang? The first three are renting the first two floors of the townhouse I own; I live on the third floor. I'm compiling a list of damages downstairs - the people before left much of it a mess, with everything from damaged windows to broken drawers, so I'm calling a handyman probably today to fix things. So no blog today. Back tomorrow, likely with an aching back. I'm off today - I'm resting from the MDTTC February Open I ran this past weekend, plus I have a todo list from here to Mars, much of it table tennis stuff. Below is a quick rundown of today's list - fortunately, I have no coaching scheduled for today, "my day off." But here's a new video (9 sec) of a great behind-the-back counter-smash to tide you over. 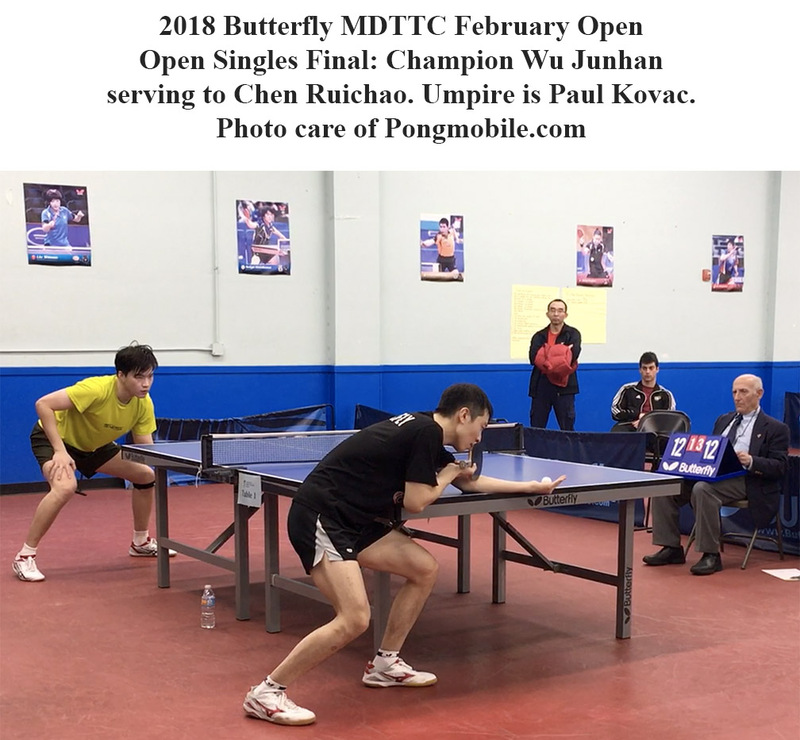 I'm running the Butterfly MDTTC February Open this weekend at my club, the Maryland Table Tennis Center. We'll have about 80 players in the eleven events. Two years ago I had an email with a pair of ITTF officials over fixing the problem with hidden serves. Both said they were working on it, but nothing so far as happened. So yesterday I sent them the following email. If nothing happens, I may once again go to the USATT Board on this. Previously I went to the Board and asked them vote to ask our Umpires and Referees Committee (then the Officials Committee) to enforce the serving rules as they are written, but it lost 6-1-1 as they didn't want to handicap USA players, since to compete internationally they'd both need their own illegal hidden serves and be able to return them. This time I'd simply ask the Board to send a note to the ITTF, imploring them to take action on this issue. My email below could be the draft of such a note. People regularly contact me about various USATT policies with their suggestions on what they think we should do. There's nothing wrong with this, as long as they approach it with an open mind - often there are things going on or info that they don't know about. But there's also this mistaken notion that I can single-handedly change things, or even that the USATT Board of Directors (of which I'm a member) would be the ones to make some of these changes. So let's look at how things actually do get done in USATT. "After the meeting Mark [Thompson] took me to the USATT storage area, and I was stunned at all the boxes of vintage stuff – film reels of vintage players from the 1930s like Viktor Barna and Lezlo Bellak; boxes and boxes of VHS tapes from the 1980s, USATT Magazines, program booklets, and so on. It was way too much to go over in the short time I had there. I may discuss having a USATT history person do a visit and spend a day going over it all." Speed and Power are Easy with Good Technique, but Good Technique is Difficult. It was another busy weekend of coaching, though not as busy as some weekends - two students were out of town, and with the Superbowl, we didn't have the adult training session. In the Beginning Junior Class we introduced them to pushing, and then the second half it was all footwork drills. At the end, they split into two groups, the older and stronger kids playing up-down tables (games to 11), while the younger ones built huge towers and walls from paper cups, and then we knocked them down with multiball. 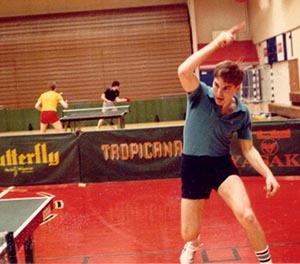 In the advanced Talent Program I mostly coached serves and fed multiball. Recent Coaching . . . and Frankenpaddle! We had week three of the Thursday Beginning Junior Class, with the focus on footwork. There are 14 in the class, ranging in age from about 7 to 12, which I run, assisted by John Hsu and Martin Jezo. We demoed various footwork drills, including forehand-forehand side to side, backhand-backhand side to side, forehand-backhand side to side, and the 2-1 drill. (Backhand from backhand side, forehand from backhand side, forehand from forehand side, repeat.) Then we went into three groups with the players alternating hitting with the coach (live or multiball), and the others hitting among themselves or doing ball pickup.